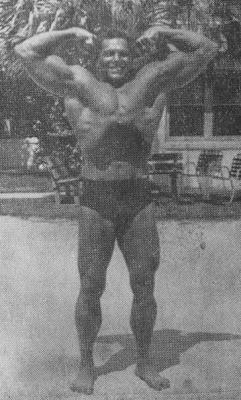 The barbell grasped with both hands (palms to the front) shall hang at arms’ length across the lifter’s front, from which position it shall be lifted to the height of the shoulders by bending the forearms completely on the upper arms. The commencement of the curl shall be indicated by the referee’s signal. 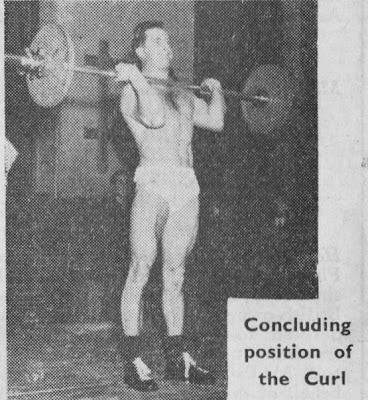 Throughout the curl the trunk must not be inclined backwards, forwards, or sideways, and the shoulders must be kept quite level, the legs straight. The slightest deviation from this position shall be counted cause for disqualification. The conclusion of the lift shall be indicated when the referee gives his signal after the expiration of two seconds. The above definition in, as naturally it is meant to be, self-explanatory, and needs no additions to guide the lifter in the manner he must perform the lift for competitive purposes. It is purely and simply an arms’ movement, but there are two points that may assist some performers in reaching higher figures. You will note that the rules say the shoulders must be kept level, but this does not mean they must be kept stationary. If it is of assistance, you can raise the shoulders, providing the above rule is not broken during the process. The second point I wish to make is that some lifters may find it advantageous to take the elbows back during the first part of the lift, bringing the bar into the body until the forearms are at the halfway position, then pushing them forward again as the forearms bend on to the upper arms to conclude the lift. These two factors may of may not improve performance, but they are worthwhile experiments in the early stages. It is when we contemplate the movement as an EXERCISE that the causes for controversy become apparent. In these days of “cheating” movements, “peak contraction” movements, etc., some lifts became different exercises altogether from the ones originally devised. The Curl is no exception. 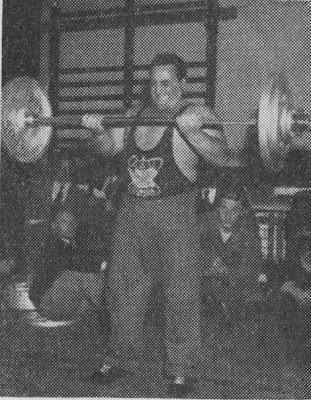 In an endeavor to increase the amount of weight the performer can handle, many bodybuilders now use the cheating method, which usually consists of bending forward at the commencement and then swinging the weight into position, using the whole body, (and even the legs) whilst so doing. I do not intend to invite any arguments by writing too much on this subject, but I would like to point out one important factor. Look at the photo illustrating the concluding position of this lift. I maintain that this is the position that MUST be attained (in fact, I feel the arms should be bent even more) if the biceps are to be correctly (i.e. adequately) exercised. I also maintain that at the commencement of the lift (and also when the weight is lowered at the end of the movement) the arms should be fully straightened. Ask yourself how often this is possible with the weights used in a cheating movement. I believe that when one is doing an exercise to benefit one specific group of muscles, one must ensure that the BULK OF WORK is done by that group; otherwise, the purpose is defeated. When you use a poundage that the muscles in question cannot cope with, you are forced to use other muscle groups to successfully complete the lift. I see no point in adding weight to help develop a muscle, if you have to overly use other muscles to lift such a weight. If you do like to cheat, do so by all means, but do not call it a “curl”. Give it the appropriate name and call it a “reverse clean”. I also give you some further advice – gratis! If you perform cheat curls, ensure that you also perform some form of the orthodox full curling movement to ensure the muscles are exercised through the full range. I believe one can successfully employ a HEAVY AND LIGHT system in conjunction with this movement. It is an “easy” exercise and does not call very much upon the performer’s energies, neither does it unduly use up any nervous forces. Consequently, a lot of work can be done without interference with the rest of the training programme, and I feel the point to watch is that one does not become too enthusiastic about “big biceps” and spend too much time on this lift. (1) 1st and 3rd days – 5 sets of 5 reps, light weights. 2nd and 4th days – 6 sets of 2 reps, heavy weights. (2) 1st and 3rd days – At the beginning of the schedule 4 sets of 4 reps with light weights, and later in the schedule 4 sets of 2 reps with heavy weights. 2nd and 4th days – At the beginning 8 singles with a heavy poundage, followed later by 3 sets of 5 reps with a light weight. Other curling movements can also be employed, but when this is done, the over-all work should be approximately confined to the limits set out above. These additional movements include single-arm dumbell curls alternately, and as a variation the reverse curl with barbell. Whenever the performer wishes to attempt this lift competitively, I think he will best be served by confining himself to SINGLE ATTEMPTS – say 8 lifts with near-maximum poundage – for the final week leading to the personal record attempt or competition. During this time he should pay strict attention to style and all the aspects of a correct lift, ceasing all curling on the two days immediately preceding the attempt.